While pets can be adorable riding on your lap , they can be as big of a distraction as checking your phone, or changing the radio station. As cute as they are (trust me I know, my pup likes to ride on my shoulders and wrap herself around me like a mink wrap!) there are a few things you can do to make sure that you keep yourself, others on the road, and your precious pup safe while you are driving. This post is sponsored by East Hills Subaru. State Laws: Laws vary by state, however, a lot of states require that your pup be kenneled or restrained while you are driving, and it can pack some pretty hefty fines if you are caught disregarding the law. So check with your local state lawmakers to find out the laws for your pets in your state. They are like your babies – so treat them like one. Get a dog seat belt or dog booster seat to keep them restrained and safe. Both are easy to use and usually work in tandem with your cars seat belt. Be sure you buy the proper size, because just like with your infant/toddler, size of seat belts and booster seats do matter. A travel kennel would work as well. Again just like with your kids, feed them before you leave! It can keep them from getting car sick, and if you feed them just about 3 hours or so before you leave, that will prevent you from having to make an emergency ‘potty’ stop. As we know parked cars get super hot in the summer – like a greenhouse. If you have to park and leave them alone, park in the shade, and roll down the windows a bit so they have a breeze, and make sure they have something to drink. 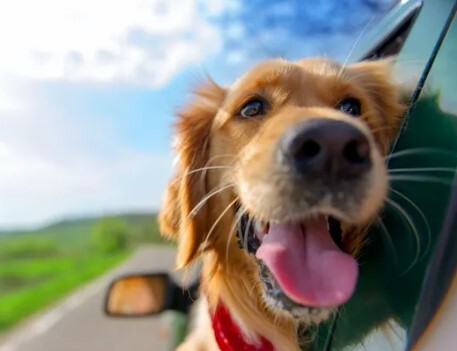 As fun as it is to see them so excited to go on a ride and want to have their hair blowing in the wind, just remember its safest for them (and everyone) if you keep them restrained and calm is the key to a safe, relaxing car ride.